These pictures are an example to help show how a properly set up Alkal Life could look when finished. The hoses may exit the unit from 3 different locations. Choose the one [or more] best suited to your counter top situation. The electrical cord may leave by another 'cut out' if desired. 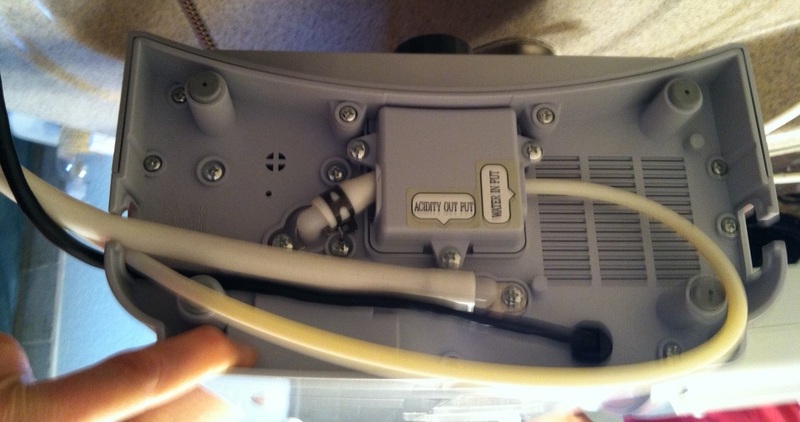 Make sure that hoses are placed on tightly, or as far onto the connector as possible, to avoid leaks. You may cut hoses to length or leave 'as is' and 'wrap' or coil behind the unit if space allows. 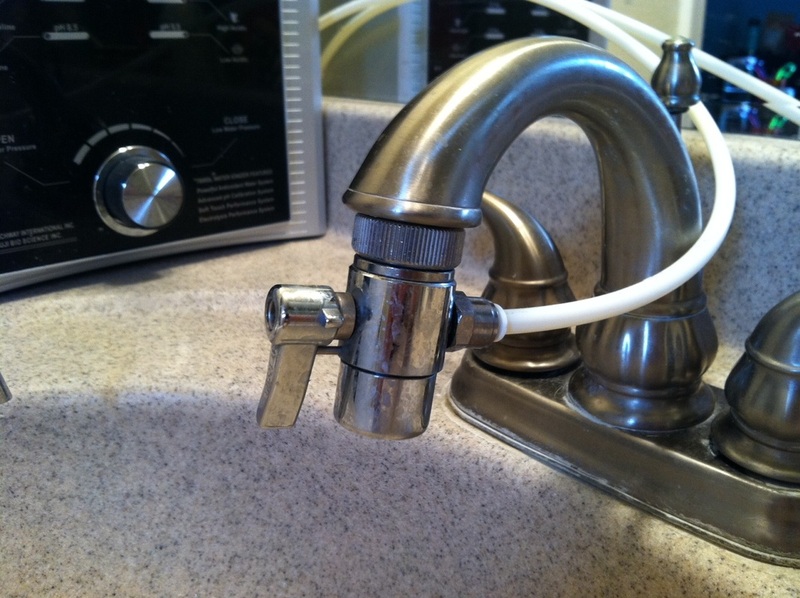 The water output spout [shown here] should always empty into a sink or drain. When the unit is on and functioning, water will discharge from this spout, so make sure it is pointing in the right direction! Don't drink from this spout, this is the 'waste' water created from electrically charging the water. It's not harmful, it's just been stripped of some of its potential. - ONLY USE COLD WATER to send through your system. Hot water damages the filter. - If the ERROR light [just below the FILTER light] comes on, it means that the water flow is too fast. 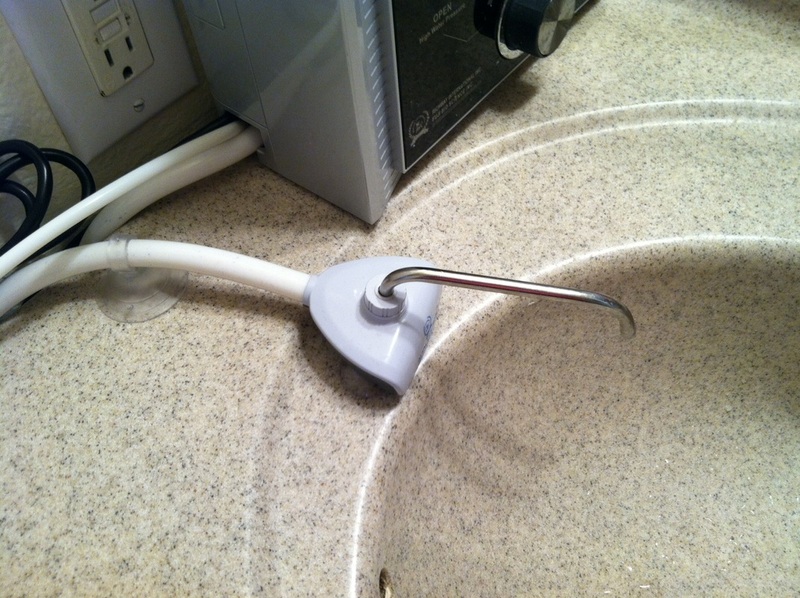 Reduce the flow by adjusting your cold water handle [less water]. The light should go off then. You may watch the speed of the water flow on the unit itself - a blue light indicator shows how fast the water is moving through. - FYI: When first using a new filter or the first time you use your machine, the activated carbon filter will discharge some loose carbon into the water through the long flexible silver spout. This is normal and expected. The activated carbon is harmless [activated charcoal is used as the major ingredient in poison centers to absorb toxins]. Simply let the unit run for a few minutes each time you get a new filter [typically every 6 months or so] and the charcoal clusters will stop coming out. Many people never even notice them.